Although looking realistically vivid, what you see here are not actually photos, but photochromes–ink-based photolithographs, popular during the 1890s. At that time, many were trying to transfer color onto prints. Lithography became one of the ways to do that, using chemicals instead of relief printing to depict the hues. 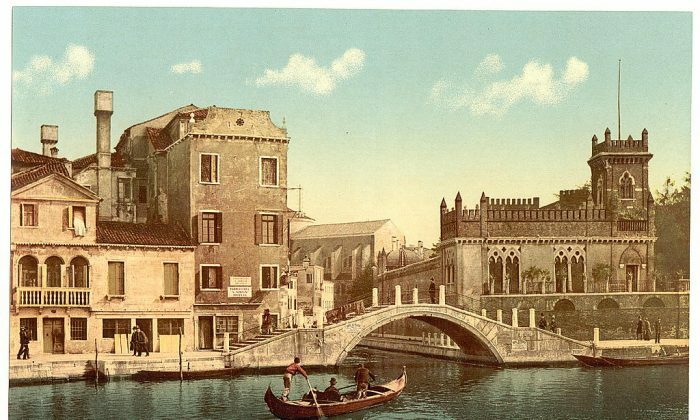 In the 19th century, photochromes were mostly used to attract travelers from all around the world. They were sold as holidays souvenirs, to be later hung on walls or just given as gifts from a visit abroad. One of the most popular ways to travel was to take part in the so-called “Grand Tour” of Europe. And Venice in Italy became a fashionable stop. Thanks to its uniqueness, the city on the water was a must-see for all culture-seeking travelers. It continued to be in a vogue until the 20th century. These photochromes are part of the recently presented collection at the Library of Congress, which includes 6,500 photochromes from 1890–1900 marking the cities of Europe, the Middle East, and Canada.